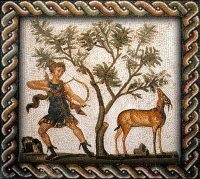 were necessary for the games: when the Colosseum was inaugurated, 9.000 animals were killed, and Suetonius affirms that 5.000 wild beasts were presented to the audience in one single day. 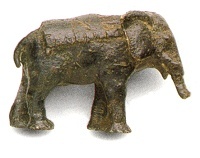 Even if these figures are exaggerated, nevertheless in North Africa lions and elephants disappeared, hunted for centuries in order to provide for the games. Bears were found in Caledonia (Scotland) and Pannonia (today Hungary and Austria); lions and panthers arrived from the Numidia province in Africa (today Algeria and Tunisia), tigers from Persia, crocodiles and rhinos from India. 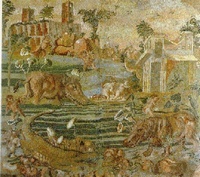 The task of collecting the beasts and transporting them in good condition for thousands of miles was enormous: animals were chased all over the Empire, and hunting, which was not popular in the late Roman civilization, became an established tradition, from what we can gather from late Empire mosaics and pictures. Moreover, the animals had to be captured alive, and this added to the dangers of the hunt. The beasts had to be trapped, put into cages, sometimes embarked on ships, fed all the way to destination and kept in good condition. The big hunts became legendary, and were the origin of many stories embroidered by popular imagination. That is why we can still find so many representations, in mosaics and elsewhere, of expeditions, captures, transport and murderous accidents. In the time of the Republic the organizers of the games had to rely on the collaboration of African or Asian governors, who in turn relied on natives for the actual capture of the animals. The authorities only had to arrange the transport to Rome. Later on, under the Empire, the enormous expenses involved prompted the State to organize it own supply system. The legions on the outskirts of the Empire provided the labour force for the capture of the animals, and there were special units exempted from regular service for this purpose. The towns along the way had the task of providing shelter and food for the beasts (some towns protested against this obligation which had became a heavy burden, since the escorts of the beasts could take it easy and stay in one city for weeks and weeks). At the end of the journey the beasts could rest in one of the vivaria, the menageries around Rome, near the Castrum Pretorium, or at Ardea and Laurentum. In the vivaria (from Latin vivus - alive) the animals were kept, tamed and - some of them - trained. Some calculations show that during Augustus time about 3,500 animals passed through the emperors menageries: 400 tigers, 260 lions, 600 panthers, and other animals of all sorts: seals, bears, eagles, etc. The costs were enormous, so high that in hard times some emperors had to cut back on expenses, by giving away the animals to private citizens as a present. The Empire had in fact a monopoly on the trade of lions and elephants, but other beasts were supplied by private merchants. 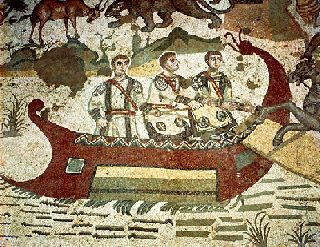 In a mosaic at Piazza Armerina there is a representation of a typical hunting expedition: animals embark and disembark from ships moored to two different sides of a promontory while an important personage watches the operation. Two characters seems to represent Africa and  maybe  Armenia, and other details are not realistic at all: probably the mosaic-workers had never seen a real hunt or some of the beasts, since their representation is inaccurate (there is even a griffin), though this can be ascribed to the legendary character of the hunting expedition, that hit the Roman imagination. 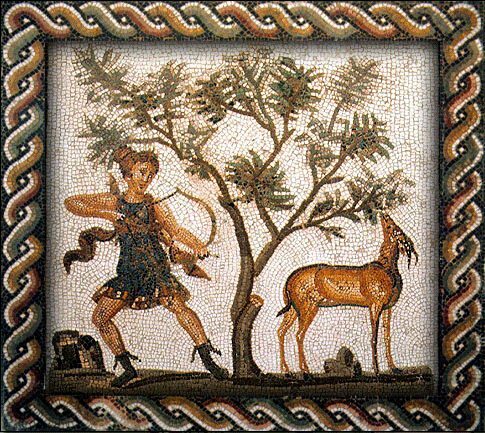 This mosaic, now in the Museo Nazionale Romano, shows the Roman taste for wonder and exoticism. Egypt, and Nilotic landscape, became very fashionable among the upper classes in the first century AD. In this mosaic the artist tried to reproduce hippopotamus and crocodiles.